As we approached Parliament on September 10th, I felt a sense of awe and distinct privilege, as if I was entering someplace sacred that carried the voices of the people in the echoes of the tall ceilings and long corridors. It was already exciting to think we were going to attempt to sit in the gallery and watch the MPs debate the recommendations of the Detention Inquiry report, the very same report so many of our colleagues, clients and friends worked so hard to put together. It became a thousand times more humbling an experience when Seddiq, a Sudanese asylum seeker who himself spent nine months in immigration detention, said as we walked towards the security tent to gain access to the main lobby of Parliament, “this could never happen in my country”. Wow I thought. Just wow. My liberty and democratic freedoms are so precious. Here we are freely and openly walking into the heart of government in the UK, without fear of persecution, without fear full stop. Once Maddy, Seddiq and I passed through the security station and x-ray machines, we came upon a unique outside photo op with Big Ben in the background from inside Parliament grounds. Seddiq was visibly proud to have his picture taken there, in fact, so were Maddy and I. The approach into the main lobby of the Commons is a breathtaking experience. As we opened the doors to one of the most magnificent buildings in the world, we were greeted by clerks with yellow bows and directed through the main lobby up the stairs where Nelson Mandela is memorialised and honoured. After turning left through the double doors and walking down a long ornate and historically decorated corridor, we were greeted by more Commons staff handing out tickets to the public viewing gallery. We were amazed at the surprisingly smooth process. With our tickets in hand, we were instructed to sit on the benches and wait to be called into the public gallery area. After 10 minutes or so, House of Commons staff swiftly issued us past the central lobby where much to-ing and fro-ing happens with Ministers, members of the public, aides, and journalists all busily preparing for their exchanges. There’s almost sensory overload as we tried to take in the grandness of our surroundings. Overhead in the central lobby is a beautiful detailed chandelier which is almost overlooked with so many other objects of beauty and history to take in. Inside central lobby is a staff desk where clerks call MPs in their offices when constituents arrive for pre-planned meetings or even impromptu sessions known as green carding*. Almost opposite this desk is a stamp collector’s dream as the central lobby is home to a small public working post office. Leaving the central lobby we were asked to fill in cards with a few simple demographic details and proceed up five or six flights of narrow stairs. At the top of the staircase was a cloakroom just outside the public gallery where we were told all items, including food, drink, phones and other electronic items, must be checked. The only things we could take into the gallery were a pen and paper and leaflets provided by the House of Commons with explanations and pictures of what were where about to see. According to the leaflet “the public gallery of the Chamber is accessible when the House is sitting, via the Cromwell Green Visitor Entrance. Visitors watch proceedings from behind a security screen installed in 2006. Sound is provided through a speaker system.” I have to admit, it was all very exciting to be so close to the process of democracy. Sitting in the public gallery we were there, right there, witnessing first-hand how it is possible to somehow hold MPs accountable to their constituents by keeping a watchful eye on them. I wondered how many people in the UK have actually taken up this tremendous opportunity to use their voices and engage with the democratic process so closely. What’s more, how many citizens even know they are allowed to get this close to the action? Escorted into the gallery, we sat down on green cushioned benches exactly like those you see in the Commons. We had a bird’s eye view of everything in front of us, including the number of MPs actually present. It was initially disappointing to see only a couple of handfuls of MPs, and even more disappointing to witness no female presence sitting on the side of the government. That did change slightly over the course of the three hour debate on immigration detention. There was certainly much activity inside the Commons, with frequent comings and goings, side chats with the Speaker, MPs reading their phones and some even talking amongst themselves. Television monitors lined both walls in the gallery which were helpful to reconfirm the name of each MP speaking at any given time. The debate was introduced by Paul Blomfield, Labour MP, Sheffield Central and was then welcomed by David Burrowes, Conservative MP, Enfield Southgate. What followed was extraordinary in the grand scheme of things and deserves to be highlighted as an incredible next step in revamping immigration detention in the UK. Over this three hour period all 25 MPs present unanimously agreed and accepted the recommendations of the Detention Inquiry report. Passionate and articulate cross party arguments for radical change by MPs were followed by fiercely enthusiastic whoops and thunderous applause from the gallery. Clerks in the gallery stepped in twice to silence the unbridled excitement, threatening to close the gallery if silence was not restored immediately. I looked at Seddiq and smiled. He gently and softly met my eyes and warmly smiled back. For Seddiq and others like him in the gallery, this must have felt like vindication. Yes, there is still a lot of work to be done. Yes, there was a lack of the same spirit of change in James Brokenshire’s (the Home Office Minister) rebuttal, but something big happened during that debate we simply cannot afford to forget. There was unity and agreement, and MP after MP stood up and argued the inhumanity of the current system. David Burrowes said afterwards during an informal chat outside the Commons that unanimous agreement has never before happened in a Commons debate on immigration. Unprecedented cross party support means there is increasing pressure on the government to act on the collective voice of the MPs who themselves acted on the collective voices of countless constituents and individual organisations who help those in and those who’ve been in immigration removal centres. When voice after voice becomes louder and stronger, and added to the many voices raised before, may we all feel encouraged, empowered and dare I say it, even excited by the experience of engaging with the democratic process. After all, for people like Seddiq “this could never happen in my country”. 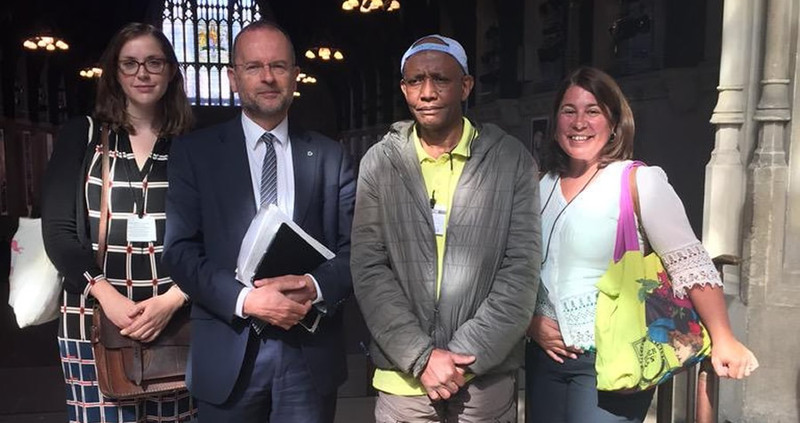 Turn up at the Houses of Parliament, go to St Stephen’s Entrance and ask to go to the Central Lobby to green card the MP for your constituency. Go to the reception desk in Central Lobby and ask for a green card. Fill in your name, address, your MP and the purpose of the visit. They insist on having your address so they can check that you are visiting the MP who represents your constituency. It is essential that you give a clear reason for ‘Purpose of Visit’. This is because if the MP is unable to meet you on the day, they have to write to you at the address provided, to respond to your query. Once you have filled in the card and handed it back, staff will go and search for your MP. If your MP is found and comes to Central Lobby, your name will be announced over the loudspeaker. It’s usually difficult to find the MP, so if the MP has not turned up within 30 minutes, it’s unlikely they’re going to show at all.